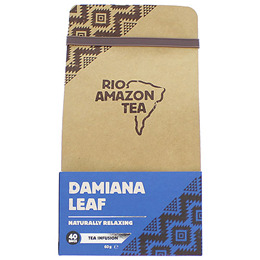 RIO AMAZON Damiana leaves are used to make a distinctive and fragrant tea. Damiana is a small shrub with aromatic leaves that thrives in hot and humid climates and is native to Mexico, Central and South America and the West Indies. The volatile oils are probably part of the reason that this tea is also used as a loving cup and the content of sitosterol may also account for this. Rio Amazon teas are made from high quality botanicals in unbleached teabags. Contains Pure shredded Damiana (Turnera aphrodisiaca) leaves. Pure shredded Damiana (Turnera aphrodisiaca). Infuse 1 teabag in a cup of boiling water for 3-5 minutes. 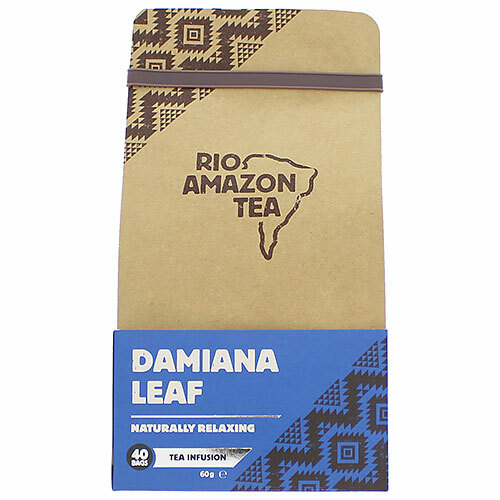 Below are reviews of RIO AMAZON Damiana - 40 Teabags by bodykind customers. If you have tried this product we'd love to hear what you think so please leave a review.